Good morning from rainy Hamburg and welcome to our first Daily FX Report of this week. Today we will report about the revived JPY and some economic data from China and Australia. We wish you a successful start for the new week. The JPY climbed to the most in almost three weeks versus the USD and against the EUR after the New York based Citi Group Inc. filed for bankruptcy. This increased the demand for the JPY as a shelter from the financial turmoil. The JPY rose to 90.02 against the USD and the JPY reached 131.01versus the EUR. After this upward trend from the JPY, the EUR could rise again to 132.66. The JPY increased to 80.80 against the AUD and even touched 79.47, the most since the beginning of October 2009. In China rose the Purchasing Managers Index to 55.2 in October from 54.3 in September. An Australia index forecast the weighted average of prices for established houses in eight capital cities which climbed 4.2% in the third quarter. Furthermore said Australia`s government that the nation`s economy will grow faster than expected and the budget deficit will be in line with a previous forecast. In China and Australia are many signs of a recovery from the financial crisis in contrast to the U.S. There were expectations about a raising unemployment rate to 9.9 percent. Since the beginning of October, the GBP has been trading in a bullish trend against the JPY. 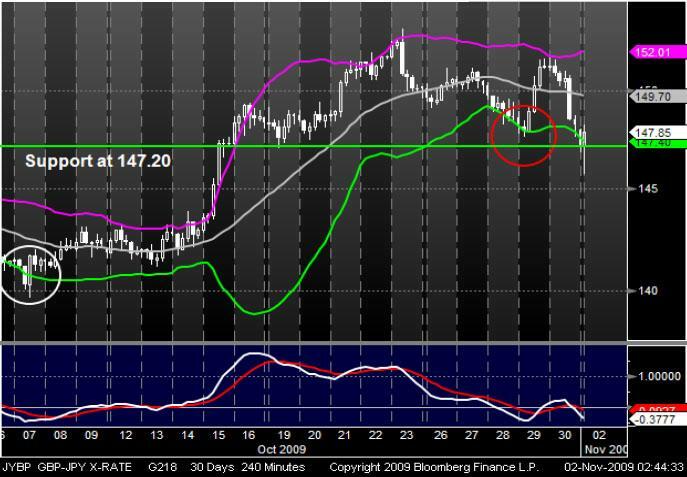 Now, the GBP reaches the lower Bollinger Band and trades near to its support of 147.20. During the last month, the currency pair touched the lower Bollinger Band two times and recovered to the upper Band. Furthermore it seems that the MACD will cross the signal line from below in a few days which may indicate a pull back from the last downturn. Since the beginning of October, the USD has been trading in a bullish trend versus the JPY. Recently, the currency pair fell to its Pivot point at 89.24. The support was strong enough and the prices could recover. 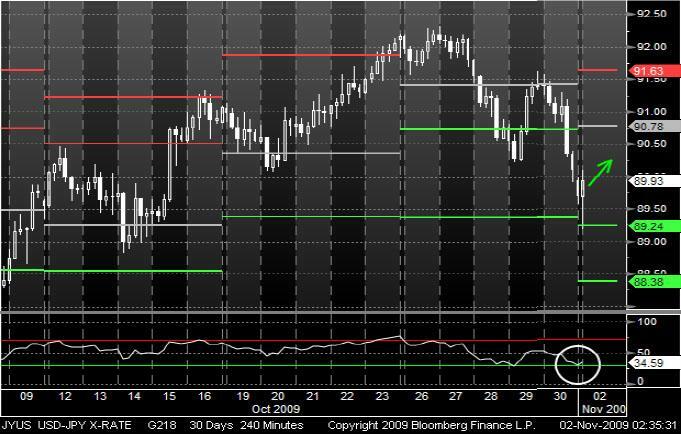 Also the RSI indicator may support an increasing upward trend so the USD could reach its Pivot point of around 90.78.